This year I made quite a few holiday treat packages for family, friends and also catering orders. Everything from seasonal cupcakes, various truffles, fudge, cookies and biscotti took up space on my kitchen counters, dining table, and in boxes lined and stacked up on shelves and tables. With Christmas only a few days away, I'm glad that a majority of my treat packages have been picked up and delivered. There's just a few more to deliver and the best part of it all is seeing the smiles on everyone's faces. 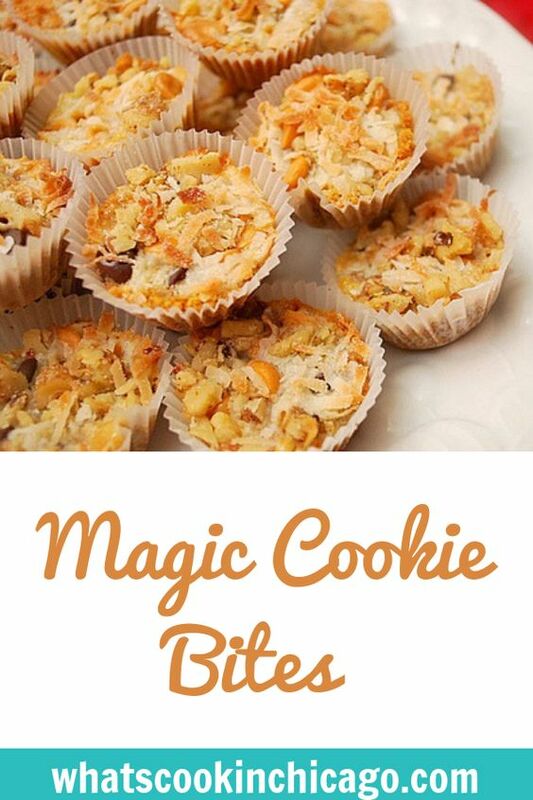 One of the goodies I've made for my holiday treat packages included these Magic Cookie Bites. A spin from the classic Magic Cookie Bars (or Seven Layer Bars), these are the perfect sweet bite of chocolate, butterscotch, nuts and coconut on a graham cracker crust. The ever popular Magic Cookie Bars, aka Seven Layer Bars are a favorite of many because it has all sorts of flavors going on and its easy to make. The one thing about the bars is that they are so sweet and rich, a little goes a long way. To make them easier to eat in just the right portion, I prepared them in lined mini muffin pans. There's less clean up and you can package them up right after they're cooled. Preheat oven to 350 degrees F (175 degrees C). Line a mini muffin pan with liners and set aside. Combine the melted butter and graham cracker crumbs in a bowl. Place a heaping teaspoon of the graham cracker mixture into the bottom of each lined mini muffin tin. Combine the nuts, chips and coconut in a large bowl. Sprinkle a bit of this mixture over the graham cracker crumbs in the mini muffin tins. 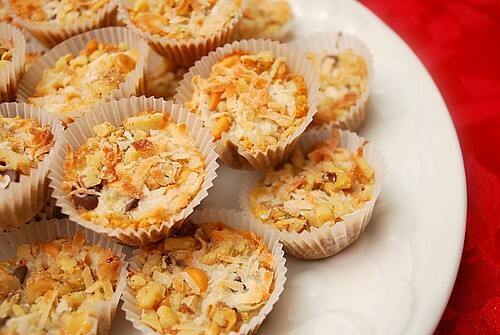 Carefully drizzle the milk over the top of each mini muffin tin. Bake 10-15 minutes or until lightly brown on top. Cool and remove from mini muffin pan. Love this idea! Will be adding this to my list of things to make this week. Hi, is the coconut sweet or unsweetened? Everything you make is delicious, thanks for sharing your truffles with us. Hope to get together again soon. Hi Sandrine! I used sweetened coconut but you can use unsweetened too since there's enough sugar from the condensed milk. That is an excellent idea!! I make those bars ALL the time cuz they are soooo easy!! Perfect for Santa. This looks so yummy! Totally my kind of treat. Can you tell me approx how many it would make? Also do you fill to the top with the condensed milk? Any chance you could ballpark an amount for me per cookie bite? A tbsp or more? Thanks for the great recipes. I am a big fan of bite-size treats & these are a perfect example. I funneled the sweetened condensed milk into a squeeze bottle which was not only less messy, but a good way to divide it between 48 mini muffin cups.